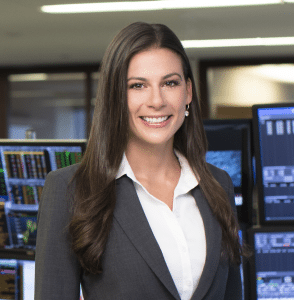 Beth Campbell, a senior vice president on our Fixed Income, Currencies and Commodities team at Citadel Securities, was recently profiled in The GlassHammer, an online career resource for women in professional services. The profile, which is part of the outlet’s “Voice of Experience” series, chronicles Beth’s journey from studying at New York University to building start-up divisions from scratch within Citadel. Develop as many relationships as possible – “Whatever role you’re in, you can find people at all levels – managers, peers, direct reports and clients, who will be integral to your journey.” Beth’s experience mirrors advice we give to those who are just starting their careers. We recommend cultivating a Career Board of Directors – a network of individuals who you formally meet with on a regular basis to review your career goals, road map, and any obstacles you’ve run into. Seek out a firm with scale and agility – With Citadel Securities, Beth suggests she found a “unique and exciting opportunity to build a new business with a respected firm.” In essence, she found a role that allows her to tap into significant resources and act with confidence that she’s empowered. You should ask questions to gauge employers about both the level of autonomy you’ll have and what resources you’ll have access to. For example, you can ask employers to walk you through how decisions are made on the team you’d be joining. You can also ask to hear about how teams came together to complete a specific objective. Tap into the experience of your peers – Beth attributes her growth, in part, to working “with a team comprised of several women in senior roles and benefiting extensively from their experience.” Regardless of your specific career goals, you have peers who’ve confronted similar challenges and opportunities before you. Ask them about how they approached these situations and what they would’ve done differently. Check out the full profile of Beth Campbell in The Glasshammer. Let us know if you have questions for Beth on how she established herself as a leader.